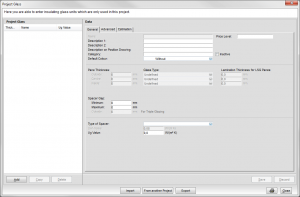 In the glazing input you may define glasses and panels. All filling types are determined one after the other. You can also select every single field. To select multiple fields, keep the left mouse button pressed and select the area of fields. Click on the right mouse button and a context menu with different functions appears. To copy fillings please follow these instructions. Select a field with a filling. Make a right click on it and select the option “Copy Filling” from the context menu. Than click on another field and select “Paste Filling”. 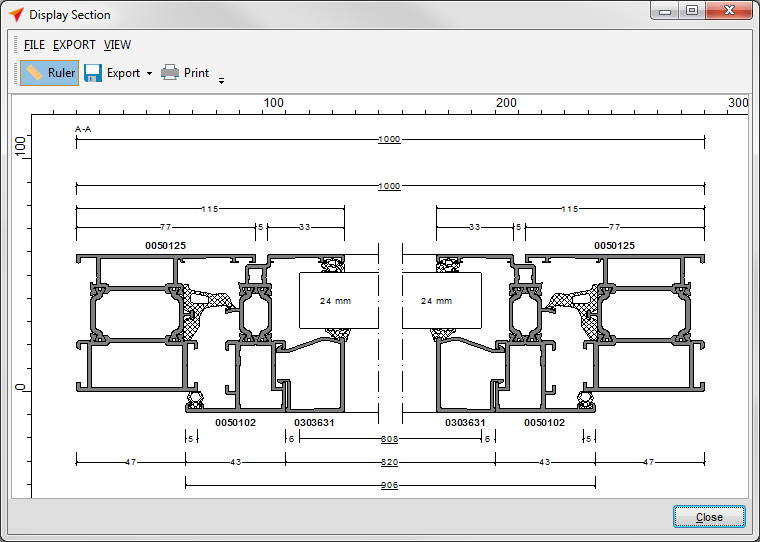 Cross Sections can also displayed in the glazing input. Therefor click on the right mouse button and select the option “Cross Section”. You may display the cross section in a new window. The drawing can also be displayed integrated in the position view. 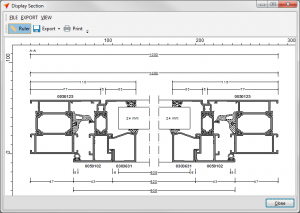 Make a right mouse click on the cross section to move or to delete the drawing. Select the option “Flag to” enter a description. On the bottom you can define the fillings and properties. You can enter glasses for individual projects. 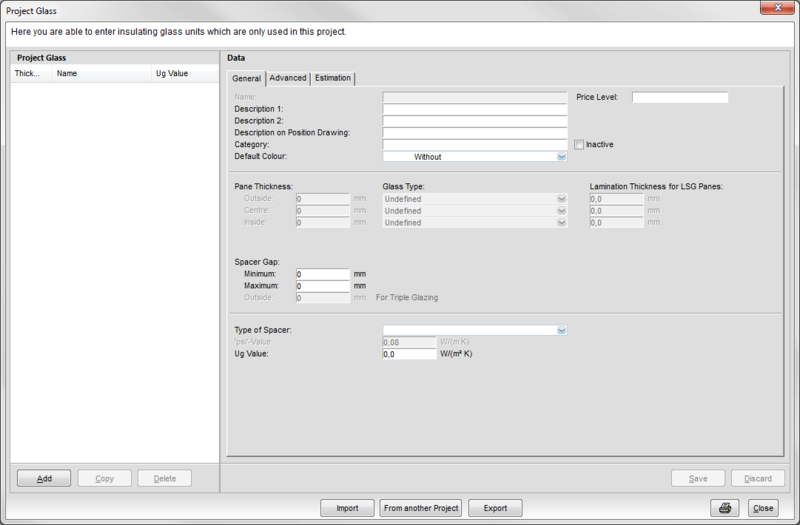 Therefor select under “Filling” the option “Project Glass”. By first using, a new window opens automatically. Otherwise you click under Project Glass the option “Enter another glass”. A new window appears. Here you may insert own glass specifications. Click on the button “Add” or “Insert” on the keyboard to enter a new glass. On the right you may determine the data. Select the button “Save” to complete the entry. 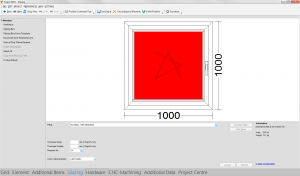 To get back to the “Glazing” input click on the button “Close”. You can enter panels for individual projects. Therefor select under “Filling” the option “Project Panel”. By first using, a new window opens automatically. Otherwise you click under Project Glass the option “Enter another panel”. A new window appears. Here you may insert own panel specifications. Click on the button “Add” or “Insert” on the keyboard to enter a new panel. On the right you may determine the data. Select the button “Save” to complete the entry. 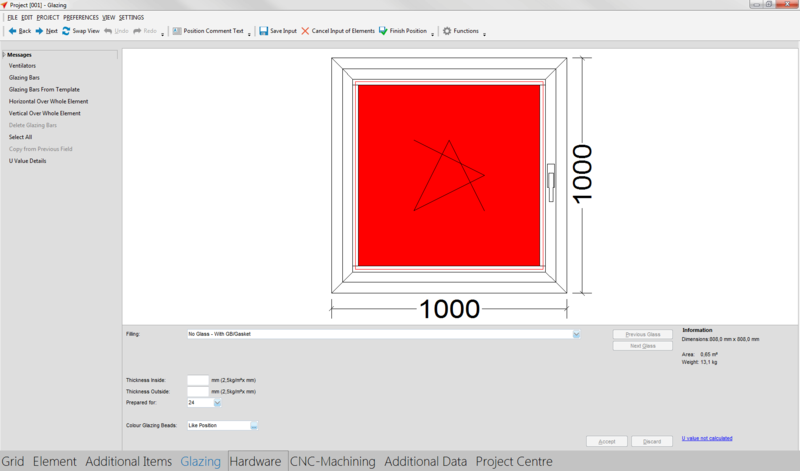 Click on the button “Close” to get back in the “Glazing” input. You may also continue the input without entering a glass. On the left you find different funtions for glazing bars. If you order window bars and gaskets for LSG Panes you have to consider the thickness of the PVB Lamination. Therefor you may find under “User Database -> Fillings -> Insulating Glass Units” the fields for correction of LSG Panes.